When you find a family on a census page be sure to look at the entire page. There might be other family members nearby. Check the page before & the page after as well. I was looking for David Ritter [b 1832 OH], my 1st cousin 4x removed and found him in Indiana. Not only did I find David, his wife & family but I found his parents [Henry & Mary] next door and his father’s brother [Philip] nearby. I came across this tombstone while walking a cemetery for Find A Grave. L Nichols [1869 OH – 1940 MI]. Their son was Richard Ray Nichols [b 1886 OH]. Sometime between 1886 & 1900 the family moved to Michigan. I have been able to find them there from 1900 – 1940. Willis L. Nichols, 31. Occupation: Carpenter. Married for 9 years. Willis Nichols, 41 b OH, Carpenter in "car shop"
Wife, Rephenia, 40 b OH, married 19 years. Trade: "Landlady" Nature of Industry: "Boarding house". Willis Nichols, 50 b OH; living at 128 E. LaBelle St.
Ray R. Nichols, 26 b OH, Occupation: Cabinet maker in furniture factory. 1930 US Census, Grand Rapids, Kent Co., MIchigan, SD 7, ED 41.
out and get some air. R is for research & some really nice people. Oswald E Reppel [1926 – 1999 LA] married Yvonne Alford. Yvonne was the daughter of Bryant L & Vinney (Robertson) Alford. Benarr Jessee Reynolds [1925 MS – 1995 MS] was the son of Thelma Lady Brown. In 1940 he lived with his grandparents, Jasper P & Rose Ella Brown and attended school. He married Jessie E Overby [b 1927 KY] in 1950 in Oregon. They had two sons & a daughter. George Ringer [d 1812] married Maria Elizabeth Ritter [1766 – 1847]. Maria was the daughter of Casper & Hanna Ottilla (Hertz) Ritter. They had eight children: John, Jacob, Daniel, William, George, Sallie, Catharine & Polly. My sixth great grandfather was Heinrich Ritter [c 1715 Germany – 1797 PA]. I have a long list of Ritters who are descendants of Heinrich & his three brothers. Heinrich & his wife, Maria Elizabeth Tutt had ten children. Many Ritters are still in Pennsylvania. At one time they lived in Rittersville. My branch moved on to Ohio. 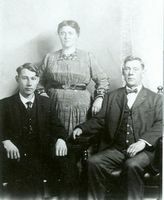 My third great grandfather, Isaac Ritter and his wife, Isabell Fisher raised a dozen children in Wayne County, OH. My third cousin, once removed, Larry Knox & his wife, Bonnie, introduced me to our Ritter connection. Over the years he has been a great resource for Ritter information. His book inspired me to write about my Mark Family. Sarah Robertson, daughter of Christian Robertson, died in Liberty, Georgia in 1810. She married Moses Brown [1777 – 1838 MS] and had four children. She is my 4th great grandmother but I know very little about her. Henry Romig married Catherine E Ritter [1773 PA – c 1835] She was the daughter of Johannes Ritter, Sr & Maria Elizabeth Keck. Henry & Catherine had seven children: Jonathan, Henry, Maria, Jesse, Charles, Susan & Lea. Karl Clayton Rowlee married Florence V Morrison [1896 OH – 1966 CA]. She was the daughter of Seth Benner Morrison & Margaret Jane Gruissy. Their seven children were born in Ohio: Seth, Karl, Floyd, Annabelle, Milton, Cliford & Ralph. In 1920 they lived in Canton, Stark, OH. Other ‘R’ surnames in my tree: Raby, Rambaucher, Raudebaugh, Reed. website with Southern Campaign Revolutionary War Pension Statements &Rosters. He recommended we take a look at the records available here. I did and found ancestors very quickly. Thanks, Charlie! Give it a try and you'll soon be thanking Charlie too. 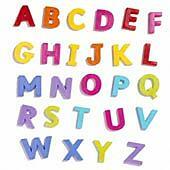 Pension statements are listed alphabetically by surname. I went to ‘F’ & looked for Faulkenberry/ Fortenberry soldiers. I quickly found David Faulkenberry [b c 1746 – 1841 TN], my 4th great grand uncle. He was the son of Jacob Faulkenberry [b c 1715]. David was living in South Carolina at the time of his service. At the time David made the following statement concerning his role in the Revolutionary War he was 85 or 86 years old, infirm and could remember very little details. His son, Jacob, added information from stories told to him by his father in years past. On this 6 day of September 1832 personally appeared before me John W. Conly Esquire, then acting Justice of the peace for the County of Rutherford and State of Tennessee, David Faulkenberry, aged, as he thinks, eighty five or eighty six years, who being first duly sworn according to law, doth, on his oath, make the following declaration, in order to obtain the benefit of the act of Congress passed June the 7 1832. He then said David being a resident of the county of Rutherford aforesaid. That he entered the service in behalf of the United States some time before the engagement took place at the Hanging rock in South Carolina, but he cannot state in what year or month [see note below]. At the time he entered the service, he lived in Cashaw [sic: Kershaw] County South Carolina. He was a drafted militia man, and entered the service in Captain John Caneston’s company, but he cannot remember the names of any of the other of his company officers. He belonged to the regiment of Militia commanded by Col. Joseph Cashaw [sic: Kershaw], and he thinks Gen. Williamson had the command of the troops to which he belonged. He was in the engagement at the Hanging rock, but he cannot remember any of the particulars of his service, or through what country he marched. He served he thinks five or six months during this tour, and was then discharged and returned home. How long he remained at home, he cannot state, but after some time he was again drafted, and served another tour of five or six months. On this tour he was under the same Captain as in the first tour and he thinks Col. Cashaw again commanded his regiment. He cannot remember anything about his other officers, except as to the General commanding officer, and he cannot remember distinctly about that. He has some recollection that during some part of his services he was in General Sumter’s army, but at what period, he cannot undertake to state positively. He was in the army at Gates’ defeat [Battle of Camden SC, 16 Aug 1780 where Gen. Horatio Gates was defeated] but cannot remember which tour of his service it was He was not directly engaged in the battle, but was detailed as a guard to take care of the baggage wagons, and was Searjant of said guard. He does not remember at what time he was discharged, but thinks he received a written discharge both tours he served. His discharges he has lost long since; he thinks he lost them both at the same time. He does not know when he was born, nor has he any record of his age. When he entered the service, he lived as already stated in Cashaw County South Carolina, and continued to live there eighteen or twenty years after the war; he then removed to & lived several years in Clark County Georgia, from whence he removed to Rutherford County Ten. where he now resides and has resided since the year 1808. He cannot state the names of any of the officers in the regular service, or anything about any continental or militia regiments, except the one to which he belonged. He is acquainted with William Pau, Randolph B. Hall, David Hall, Samuel Fulks and others in his neighborhood, who he believes will testify as to his character for viscity [sic: veracity], and their belief of his services as a soldier of the revolution. He has no documentary evidence of his services and he knows of no person whose testimony he can procure to prove his services. He hereby relinquishes every claim whatever to a pension or annuity, except the present, and declares his name is not on the pension roll of the agency of any State. This 6 day of September 1832 personally appeared before me John W. Conly an acting Justice of the peace for the County of Rutherford and State of Tennessee, Jacob Faulkenberry, aged about Sixty-two years, who being first sworn according to law, doth upon his oath state that he is the son of David Faulkenberry, the applicant in the foregoing declaration, that the services of his father as a soldier in the revolutionary war are connected with his earliest recollections, that he has always understood from his father & others that he did serve as a soldier, and he has heard him, when in the full vigor and perfect exercise of his memory, give a circumstantial detail of his services. He has a personal recollection that after Gates’ defeat, his father was ordered as he supposes to collect all the public property that could be found scattered through the country by the retreating army, and that he did collect and bring guns, baggage &c. and bring in, in considerable quantities to be disposed of according to such directions as might be given by the authorities of the United States. His father is very old, and extremely infirm. His recollection has so much failed that he can scarcely remember events now passing around him an hour after they have taken place. And his recollection of his services has become exceedingly imperfect, so much so, that at times he cannot remember anything about it until some particular circumstance in relation to them is mentioned. He is a cripple in both his hands, which affiant has a recollection was produced at his own house by the Tories, on account of his attachment to the Whigs, by cutting him to pieces with their swords. He was also wounded by a ball at the same time, which is now in his arm. NOTE: There were two engagements near or at Hanging Rock in present Lancaster County SC. On 30 July 1780 Maj. William Richardson Davie led North Carolina partisans on a diversionary attack on Loyalists near Hanging Rock. On 6 Aug 1780 Gen. Thomas Sumter led troops including South Carolina militiamen in an attack on Loyalists at Hanging Rock. I could not identify a Capt. Caneston or a Gen. Williamson. P is for parents & partners and plenty of people! This is my husband’s maternal line. The Palilla family came from Italy. Calogero ‘Charles’ Palilla was born in Sicily in 1894, son of Dominick Palilla. He married Grazia Brgandi who was born 1901 in Sicily. Both were here by 1920 when they were married in CT. Their four children were born in New York State. Ralph Alvin Parker [1901 OH – 1979 OH] married Nellie Irene Joliff [1903 OH – 1994], daughter of Samuel Martin Joliff & Margaret Maude Mark. 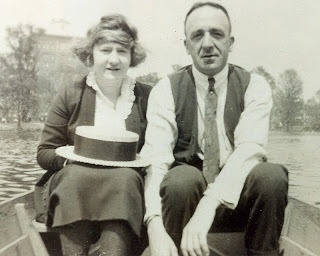 Ralph & Nellie were married 1923 in OH. They had three children. This is my husband’s paternal line. Stories vary concerning the name change. This family came from Italy. Dominic & Giovanna Pascale had two sons. Augustino [1855 Italy – 1929] married Maria Grazia Servello. They had six children. Thomas [1873 Italy – 1958 NY] married Camella Arena. They also had six children three born in Italy and three born in NY. My husband’s paternal grandparents were Frank [1889 Italy – 1973 NY] son of Augustino & Giovanna [1898 Italy – 1988 NY] daughter of Thomas. Giovanna ‘Jennie’ was famous in the family for her delicious meatballs! Johnson Patrick [1812 – 1856] b married Nancy P Brown [1815 MS – 1862]. Nancy was the daughter of Moses & Nancy Brown. They had nine children: Rees, Joseph, Amanda, Willis, Emily, David, Lucinda, Charles & Elizabeth. Nancy Perkins [1787 – 1870] married Moses Brown [1777 – 1838 MS]. Nancy was the daughter of James Perkins. Nancy & Moses had seven children: Amanda, Nancy, Margaret, Moses, Aaron, Rees & Samantha. Other ‘P’ surnames in my tree: Pearson, Peddicord, Pendley, Perry, Peters, Purdy & Puzzo. Even though Richard Dillon, my 5th great grandfather, was born in Virginia and died in Mississippi, he spent considerable time in Bertie Co., North Carolina as evidenced by these records. Source: Haun, Weynette Parks. Bertie County North Carolina County Court Minutes 1740 thru 1743; 1758 thru 1762. Book II. North Carolina: 1977. From the Charlotte Mecklenburg Library, Charlotte, NC. May 1777. Richard Dillon, witness to a will. Source: Almasy, Sandra L. Bertie County, North Carolina Wills 1761 - 1780. Joliet, Illinois: Kensington Glen Publishing, 1990, page 124. From the Charlotte Mecklenburg Library, Charlotte, North Carolina. Aug 1785. “A Deed of Sale of Land from Rich. Dillon & Ann Dillon to Benj. Terlington was proved in open court in due form of law by the Oath of John Wolfenden one of the subscribing Witnesses and ordered to be registered.” Source: Haun, Weynette Parks. Bertie County North Carolina County Court Minutes 1781 thru 1787. Book V, Durham, North Carolina: 1982, page 81. From the Charlotte Mecklenburg Library, Charlotte, N.C.
Feb 1787. “Ordered that William Billips Richard. Dillon & Wm Cook be appointed searchers in Catpn. Ashburn’s District.” Haun, Weynette Parks. Bertie County North Carolina County Court Minutes 1781 thru 1787. Book V, Durham, North Carolina: 1982, page 123. From the Charlotte Mecklenburg Library, Charlotte, NC. Feb 1787. “Ordered that Fredk. James be bound to Richard Dillon to learn the trade of a Cooper.” Source: Haun, Weynette Parks. Bertie County North Carolina County Court Minutes 1781 thru 1787. Book V, Durham, North Carolina: 1982, page 126. From the Charlotte Mecklenburg Library, Charlotte, NC. Feb 1787. Richard Dillon to serve on a Grand Jury & a Pettitt Jury. Source: Haun, Weynette Parks. Bertie County North Carolina County Court Minutes 1781 thru 1787. Book V, Durham, North Carolina: 1982, page 127. From the Charlotte Mecklenburg Library, Charlotte, NC. Nov 1789. “A Deed of Sale of Land from Rich. Dillon & Ann Dillon to Andrew Stanton was acknowledged in open court in due form of law by the said Richard Dillon and ordered to be registered.” Haun, Weynette Parks. Bertie County North Carolina County Court Minutes 1788 thru 1792. Book VI, Durham, North Carolina, page 46. From the Charlotte Mecklenburg Library, Charlotte, NC. By 1810 Richard Dillon was living in Mississippi where he died & was buried. In September of 1813, during the War of 1812, Oliver Hazard Perry of the U.S. Navy and his crew of 557 brave patriots prevailed over the British fleet in the Battle of Lake Erie near Put-in-Bay, Ohio. Two hundred years later, we will come together to celebrate Perry’s victory, our nation’s sovereignty and the enduring peace between nations. As caretakers of our freedom, we are called to bear witness to history in our own special way. The torch has been passed to our generation, who enjoys the great bounties of Lake Erie that were secured forever by Perry and those who came before us. I follow a blog called “New York History: Historical News & Views from theEmpire State”. At the end of each week they post intriguing articles from various parts of our state. Recently I read about the anniversary of the Battle of Lake Erie. This led me to the Old Salt Blog that led their article with Olive Perry’s famous: “We have met the enemy and they are ours; two ships, two brigs, one schooner and one sloop.” Visit Old Salt & watch the video of the warship. Old Salt gives a link to the Battle of Lake Erie Bicentennial Website. The Bicentennial Website gives information on: History, News & Info, Get On Board, Photo Gallery & the Foundation. Visit the site and learn about the celebration that has run for several days. 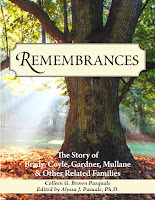 Learn more about important events in the lives of our ancestors. I wish I lived closer. I would join the fun! The Niagara is a squared-rigged, two-masted warship originally armed with eighteen carronades and two long guns. On the berthing deck were sleeping quarters for the officers and crew, storerooms, sail bin, and a wood stove. Magazines for shot and gunpowder were stored in the hold below deck. The Battle of Lake Erie was fought on September 10, 1813. During the conflict’s initial stages the Niagara was not engaged. However, after two hours of desperate fighting the U.S. Brig Lawrence, Perry’s first flagship and the Niagara’s sistership, had been battered into a defenseless hulk. Perry then transferred his battle flag to the Niagara and assumed command. Sailing the Niagara between the British battle line, Perry utilized his new flagship’s firepower to the fullest, ravaging the enemy fleet and compelling the entire British force to surrender. For her efforts the Niagara lost 2 men killed and 25 wounded. Perry’s aggressive action and the Niagara’s heavy guns together tolled the death knell over British dominance of Lake Erie. 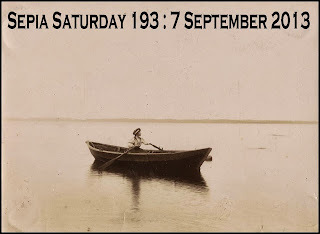 This week's Sepia Saturday photograph shows a young girl in a rowboat on a lake by herself. This reminded me of the above photograph of my grandparents. They are in a rowboat in Central Park, New York City. They were still courting and not yet married. With them was Helen's youngest sister, Kathleen G Coyle, who snapped this picture. I love this photograph. I love the way my Nana is holding the hat for her boyfriend. I love that he is wearing a tie and she is wearing a pretty blouse & skirt for their outing. Most of all, I think I love this because it looks like they are looking at me, their only grand daughter, and I wonder what they are thinking of me. 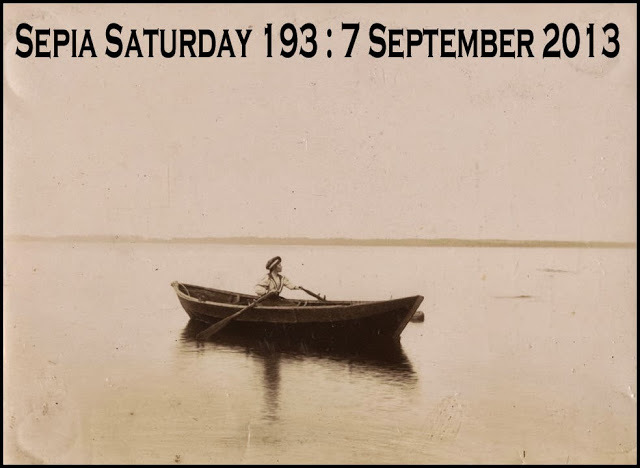 Float on over to Sepia Saturday & see more great photos! 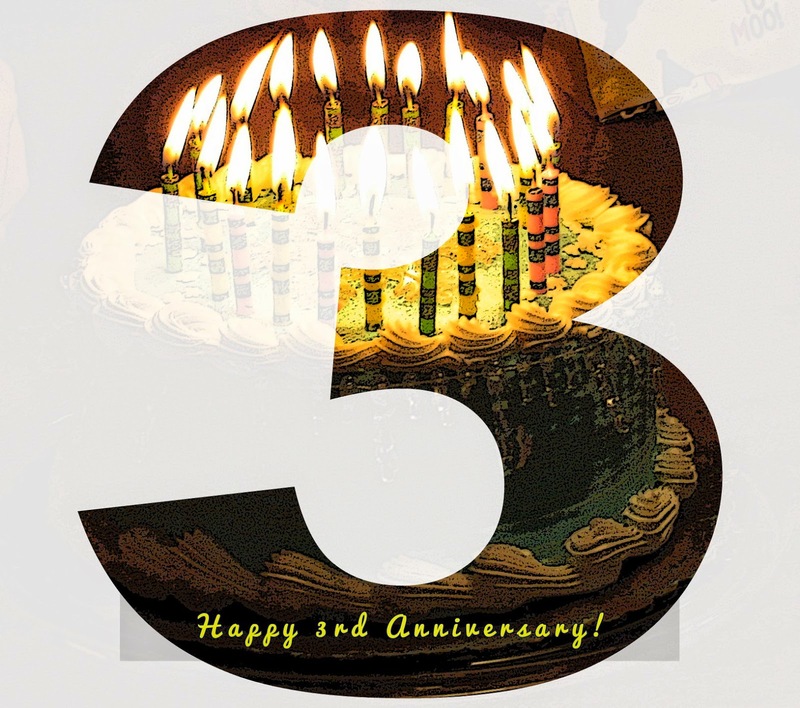 Three years ago today I wrote a post: Pennsylvania Research for the Mark Family”. I had been traveling & researching in Pennsylvania and decided that was a good topic to take my first steps in blogging. I had very little idea of where I was headed. I didn't know anyone else who blogged about genealogy and wasn't sure if anyone would read what I had written. 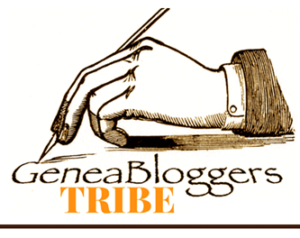 Finding and joining Geneabloggers was super. I love reading other blogs, looking at the layouts of other pages and finding connections. ‘Meeting’ other bloggers has given me confidence and many new friends. Thanks to my visitors, followers & friends! I love reading your comments. You inspire me to keep on posting. If you were here I'd offer you a cup a tea, a slice of cake & we could sit and have a nice chat. Till then we'll connect here, in cyberspace. The prompt for week 1: Ask yourself 20 times “Who are you?” Each time you should give yourself a different answer, and if you can easily go beyond 20 entries then that is fine too. This prompt is about how YOU see YOU. Give it a try and check in with Julie for more prompts. I am the result of a long line of strong, independent women. 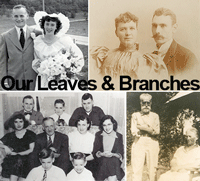 I am a descendent of an Irish baker, a Western Union telegrapher & a Mississippi wheelwright. I am a collector of postcards, family memorabilia, photographs and ancestors. I am an enjoyer of holidays and traditions. I am a gatherer of letters & documents, of names & dates. I am an organizer who likes folders and paper and pens in many colors. I am a journaler, a scribbler, a would be novelist. I am someone who learns and grows; who teaches and shares. I am a traveler, an explorer of new places. I am a beach walker, a seashell collector, a wave splasher. I am a photographer, trying to preserve today for tomorrow. I am a lover of color & texture, of fabrics and threads and quilts. I am a grower of pink roses, white baby’s breath and yellow marigolds. I pamper my cats and feed the birds. I laugh and cuddle with children. I reread favorite books, so I can visit the characters again. I light candles and whisper prayers. I gaze at stars and imagine. I love and dream and wonder. I am a small part of a marvelous universe.